For beautifully crafted custom bathroom mirrors, the company that homeowners in Pensacola, Florida, and surrounding communities continue to trust is 31-W Insulation. 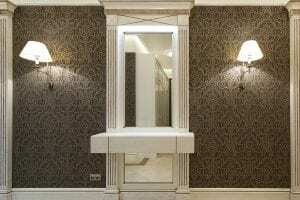 Whether you’re looking for a crisp, sleek mirror with a crystal-clear reflection and low-profile frame, or something more decorative and less functional, with a subdued reflection and a frame replete with ornate embellishments, the home improvement experts at 31-W can help you find what you need. When you partner with us for a new bathroom mirror, you can trust that the job will be done correctly the first time, as we rely only on our highly trained team of technicians, never subcontracting the labor out to a third party. This allows us to enforce stricter standards of quality control when it comes to the installation process, and it helps us deliver more consistent customer care every time we take on a job. During installation, our team will keep any disruption to your family’s daily routine to a minimum and will leave behind a spotless work area. If you live in the Pensacola area and would like to learn more about the bathroom mirrors that we install, contact 31-W Insulation today. We would be happy to answer any questions you may have.